From the early 1980's, I was doing research on Peking operas while preparing myself for literary writing. My first essay was "In Memory of Luo Longji." After I finished, I quickly handed it over to my husband (Ma Keyu) to review. He graduated from the Department of Chinese Literature of Peking University in 1955 and specialized in operatic literature. As far as literature goes, he was the expert and I was the amateur. Before he began the review, I gave him a Zhonghua brand pencil and whispered in his ear: "If you see any section or sentence that was alright, please make a circle next to it for the sake of encouragement!" He smiled. After that smile was gone, our relationship turned from husband-wife to teacher-student. He sat while I stood. He went through the pages that contained almost 30,000 words, one at a time. I stood there and watched the pencil in my husband's hand remained stationary. My heart sank. Finally on the last page, he drew a series of circles. I knew that was done only for the sake of encouragement. As I looked at the last circle, I was ready to cry. My husband told me to sit down and told me solemnly: "Xiao Yu. You have a rich experience and memory. When we chat, I listen to you describe this person or narrate that event, it was lively and personable. But once you put it down on paper, you just lose that ..." He spoke as if he was lecturing a grandchild. "Do you know what you lack?" "I lack a vocabulary!" I said. "You don't lack vocabulary. You lack literary training." Oh, so what I lacked was literary training! So I began a marathon training regime. I read ancient poetry, essays and novels every day, and I read contemporary materials. I subscribed to many periodicals, including <Novel Selections> and <Novel Monthly>. I selected those works that appeared to be superior and I showed them to my husband for evaluation. He looked at me like a court judge: "You tell me what is so good about it?" Once I heard that tone, I knew that I had made another mistake. After several years, I ended up reading the literary works for many of the current authors, especially medium-length stories. Among these, there was one entitled <Death by Chorus> which delighted me in particular. I began to find out more about the author who was named Wu Fayun, and I recommended the book to my acquaintances. The book described Fei Pu, who was the child of one of the Kuomingtang-era elders. Since 1949, he had moved from the British lease area to under the Red Flag. From youth to old age, he spent his whole life trying to reform his old ideas and adjust to the new environment. In the end, his family, position, wealth and occupation all changed, but he could not change his inherited spiritual state. Due to his cultural stubbornness, Fei Pu had a hard life. I was in tears as I read the story. I spent my own money to photocopy many copies of <Death by Chorus> to give to those female friends who came from well-off families, studied at schools ran by churches and knew how to sing chorus. They had the same reactions. So when we got together, we talked about <Death by Chorus>. Many years passed and I finally met Mister Wu Fayun. But our topic of conversation was not about <Death by Chorus>. Instead it was about death by cancer. My husband had died a few years ago, and his wife had died more than a year ago. Since our closed ones both died from the same terminal disease, our initial topic for conversation was about pain and death, and this is a recurrent topic for us. When he reached this point, Wu Fayun reflected: "Fifty-one years of living. Thirty years of acquaintance. Twenty-six years of marriage. This was like a flower that I planted and I saw the beauty of a woman's lifetime. This sort of beauty is visible only to the planter ... even if the flower should wither, it is still possible to perceive the infinite grace. This is like the batch of withered mountain chrysanthemum and forget-me-nots at home." This elegy enabled me to see a sacrosanct love whose destiny was achieved with a lifetime of dedication. Outside the window, the sun shines coldly. My heart was filled with sorrow. The strongest and also most vulnerable relationship in the world is that between husband and wife. Husband-wife? Who really knows what it means to be husband and wife? When I was small, my father talked about the personal life of Luo Longji and he said: "In China, there are not many men who understand women; there are not many women who understand men either." I have never met the wife of Mister Wu, but I feel that he understood his wife and he is a man who understands women. It had been my second marriage. The unique characteristic of this second marriage was that both parties settled all the issues beforehand and that was more important than the weight of the sentiments. Therefore, after our marriage, my relationship with my husband was as plain as the "independent unions" -- it was a loose alliance. We each had our own apartment, we did our own business, we read our own books, we were economically independent, we kept our own friends. It was very unremarkable. Once he fell ill, something bloody emerged from behind the plainness! I suddenly realized: He was not my husband -- he was my entire life. I cried and begged the doctors: "Save him! I will swap my life for his!" I fainted twice in his sickroom. The first time that I collapsed on the floor, he screamed: "This is not a hospital. This is the tiger's jaw. We cannot both fall into it. You must escape! You are not allowed to visit me as of tomorrow!" On the second time, he could only look at me with infinitely sorrowful eyes. My husband was getting more sick. At the time, I had just finished the draft for "In Memory of Zhang Baoju and Wife." He struggled and read one or two pages a day and made annotations on the draft. He said with difficulty: "Xiao Yu, you are writing a lot letter than before. But there are still many problems. When I get better, I will help you edit." More than a month later, my husband probably realized that there was no likelihood that he could edit my manuscript. So he took the manuscript from underneath his pillow and gave it back to me: "Keep writing. Keep writing. By the time that I die, you will have succeeded." One day, my husband was still looking fine. He sat up and held my hand. "To be born, to grow old, to become ill and to die are the four stages of human life. The last three stages are all bitter and the birth may not be pleasurable. The ancients set morality, accomplishment and writing as the goals of life. Xiao Yu, none of that is important to you. The most important thing is that you have to live on! This was what your father told you back then, and this is what I am telling you. I am not worried about your work, but I worry about how you live. You don't know anything. After I die, who is going to help you collect your wages? When the toilet is broken, who is going to fix it for you? When the lamp cord is broken, who is going to re-attach it for you? You cannot live by yourself. Please find another man." I buried my head in his chest and I started to cry aloud. "Death" is the end. "Old age and illness" is between life and death; that is, one is half-dead, half-alive, and that is the most painful. Both he and I are half-dead, half-alive persons. On one Sunday, his two children came to visit. He sensed that he did not have many days left to live and he begged his children with tears in his eyes: "You must take care of Auntie Zhang after this! Promise me, promise me!" His voice was breaking up and his expression was moving -- at the moment when Death arrived, when husband and wife bid farewell and I reached old age, I finally understood love and I also understood men. As I went through his belongings, I found a file of papers. On each piece of paper, my husband wrote the same sentence in pencil: "From now on, it will be hardest on Xiao Yu. From now on, it will be hardest on Xiao Yu." My husband died at the Beijing Chest Hospital in Tongzhou. He passed away six years ago. For the next six years, I have never traversed Sihui Bridge and I never laid eyes on Dongfanghong. I gave up what we used to do together: watching movies, watching ballgames, writing couplets, playing chess, listening to opera and taking strolls. I used to think that there are only two things that belong to oneself. One is the sentiments, and the other is health. As my husband departed slowly while looking back at me, I suddenly realized that one cannot cling onto anything in this world! The desperate solitude inside me exists with my life. As long as I am alive, it will be deep inside my heart. Over the past few years, I frequently spoke to Mister Wu by telephone. We would chat on for dozens of minutes. During the chats, I learned that he had withdrawn from the Wuhan, Hunan and national Writers Associations. He returned all the various titles that he never wanted and never used. Wu Fayun believes that it was an insult to the emotional quotient and intelligence quotient of a writer. So he became a writer who lived inside the system and thought outside the system. He lives in one apartment and he has another apartment in which he kept the physically handicapped cats and stray dogs. I asked: "Why do you want to keep them?" He said: "When you see them in the street, the look in their eyes is enough to touch you!" Sometimes, he holds the telephone high so that I can hear the cats meow and the dogs bark. In the summer, I advised him: "It is too hot in Wuhan. Come and live in Beijing!" His reply was very simply: "I'm used to it." In the winter, it was his turn to advise me: "Are the windows shut? Have you put on enough clothes? Are you eating well?" Our communication is infrequent and loose, but we seem to be as meticulous as neighbors. I tend to be pessimistic, dejected and despondent. I wrote in a letter to him: "I'm just waiting to tell all the stories. Then I will go and finish myself. I may head east until I sink into the ocean; I may head west until I vanish in the desert." He hurried to tell me: "Things may not be very good now, but we ought to have some warm expectations." 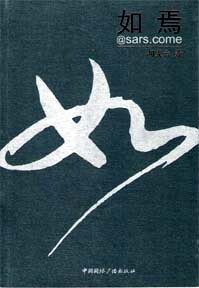 I read his long novel <Ruyan> on the Internet through the recommendation of a friend. I was ecstatic! For a long, long time, I have not read a literary work that faced reality so directly. The novel was brimming with emotions, the language was plain and simple and behind the calm were the waves of ideas. I will use the saying: "There was no literature during the two Jin dynasties except for Tao Yuanming's <The Poem of Departure and Arrival>" as my evaluation, "There is no literature in this era except for Wu Fayun's <Ruyan>." Someone said that this is overstating the case. By coincidence, another netizen came up with a similar evaluation when he wrote: "I had no idea that such a writer exists in Hubei. After reading <Ruyan>, I had the sense that 'this single literary work dominated the entire Tang dynasty.'" If you are careful, you can detect vague hints about "SARS," Jiang Yanyong and Li Shenzhi. These are sensitive events and persons! A reporter asked him: "Aren't you afraid? Can you deal with the consequences?" He said: "I can deal with what I felt from my heart that I must express honestly. It does not matter whether this brings me honor or disaster. It does not matter where goes smoothly or badly. I fully appreciate the joy in being able to write what you want to write. Any event that shocked or hurt the public should naturally also be reflected by a writer in his heart and he will not abandon it due to fear." In the book, there are three figures of wisdom (teacher Wei, Damo and the mother of Ruyan, and the implied meanings are profound. Suffering, enjoyment, subjugation, domestication, understanding and stupidity were all interpreted and realized through the conversations and actions of the three figures of wisdom. Wu Fayun allowed ample imagination for idealism and rationality. Our country do not lack preachers, but it lacks thinkers who can really think Therefore he said that this book was "about the search for the missing thinkers in history." The meticulous details in the love storyline and the tragic end to the figures of wisdom also showed the aesthetic values and magic language of this long novel. When <Ruyan> first came on the market, it was hot. Then it was cooling down. Suddenly there was a twist. A deputy director of the General Administration of Press and Publications held an "informational meeting" of the national publishers on January 11, 2007 and announced that there were eight books that "violated publishing regulations in 2006." The list includes my <Peking Opera Stars> as well as his <Ruyan>. A reporter asked Wu Fayun: "When <Ruyan> got banned, what was your first reaction?" He replied: "My first reaction was that this was absurd and risible. This was like a prank by a naughty boy who does not know what he was doing or the consequences. This is the electronic age of the Internet. Apart from challenging the emotional quotient and intelligence quotient of the large numbers of readers, media and commentators out there, there is nothing positive about it. This illegal and irrational form of book banning is like hitting someone on the head from behind in the middle of the night ... as I wrote in <Ruyan> -- 'When they won't let you speak out, it proves that you are telling the truth.' This is a rule that has repeatedly been shown to be true. Perhaps they have absorbed the past lessons about how their shameful acts were recorded down on paper. I joked with friends that many instructions and directives from the Communists are usually verbal, or else the documents are immediately burned or swallowed into the mouth. But that was when they were an underground party whereas they are the ruling party today. So why are they still acting like an underground party?" Immediately, sales for <Ruyan> soared. In Mister Wu's own descriptive words: "This novel had actually served its mission. But just when it was ready to take a curtain call, it got another chance to make a lovely turnaround." Wu Fayun's next work will be about the Cultural Revolution. Or perhaps it should be described as a work that pertains to the Cultural Revolution. I advised him to leave it aside for now because the subject is too sensitive and the government will not let it pass. He said: "A historical event in which more than a billion people paid such a terrible price should have hundreds and thousands of works written about it already. But nobody has really written about it up to now. People don't even challenge the absurdity of this situation. Well, I am going to write about it!" <Ruyan>'s back cover has an excerpt from Pushkin's poem: "If life deceives you, do not be depressed or angry." He often uses this sentence to comfort me. Actually, he is personally depressed as well as angry. My <Peking Opera Stars> was on the banned list. The official even spoke about me although without naming me: "This person has problems with her thoughts. We have repeatedly said that her books cannot be published." I rememembered that my first book <The Past Is Not Like Smoke> (the title of the Hong Kong edition was <The Last Nobles>) was banned because a deputy director of the United Front Work Department deemed it to be an "anti-Party declaration." It was quite obvious: during the 50 years between 1957 and today, I was classified by the leftists as a rightist. So what if I am rightist? Someone else might be ashamed, but I was honored to be able to stand alongside my parents. But nobody can use this as the reason to strip away my basic citizen's right. I decided to put up my life to take back what is mine. I made a declaration: "I promise to defend my words with my life." Mister Wu saw that on the Internet. He supported me, but told me not to get mad: "You should eat well, drink well and sleep well right now." So many friends tell me the same thing. Even total strangers sent their heart-felt regards through various means. As the book went through its ups and downs, the concern shown by the world touched me. It is not as if I had not seen the world or not gone through storms. Those innumerable unnerving nightmares and the overwhelming despair never gave me a normal heart in my chest. As my tears fall down and my blood rushed up, I shall fight for my minimal dignity and conscience. Writing is self-conversation. The writers in the past and today are all prisoners of language. They lift up their pens because they have something to say, they are interested in saying it and there are people who like to hear them say it. For someone who "was not born easy and will not die smoothly," only writing can enter my body and stimulate my life. When I lay out the paper under the lamp, I am content with that little bit of warmth. In the last several decades, we either tied literature to the wheels of the revolutionary war chariot, or else we tied literature on the wings of the reforms. We wanted to harness the strength of literature to spin the wheels faster or make the airplane soar even higher. We wanted to the winds of reform to lift literature even higher. I am incapable of and I do not want to assume this responsibility. The years of the past covered the path of my entire life, and I only know how to relive the old dreams. I use my soul to invoke the dead souls. "The painted ship has taken the spring away and left only the moon that shone on half the river." In this sense, I am extremely lacking in any practical sense of responsibility and I am a laggard of my times. I am thinking -- when the large group of people head towards the morning sun while singing the march song aloud, will the great society accept some negligible person like myself who sits by the roadside chanting an elegy in low voice? Of course, they should also allow Mister Wu Fayun write his long novel about the Cultural Revolution. I believe that he will write it. Perhaps he is writing it right now.